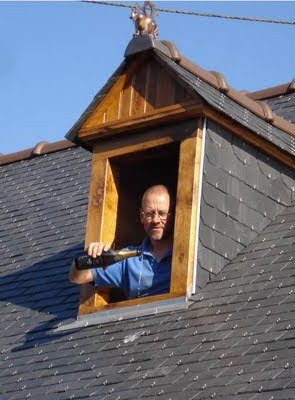 The roof for the new gite is, at long last, finished. A dodgy roof allows the weather in and will ultimately do for a building. We had to replace the roof, to protect the building and, even if we would only ever use the barn for storage, the floor needed replacing. 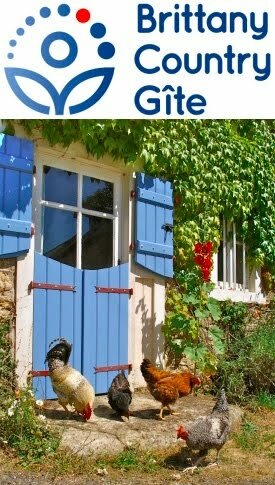 With all the hard work done, and the biggest cheques written, it seemed sensible to go a little further and create another gite. The oak carpentry of the roof was basically sound but the soffits and rafters got replaced. Over them was laid a breathable, yet waterproof sarking board made by Pavatex. 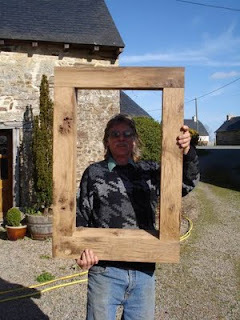 Our friend Jim planed down some old oak timbers I’d acquired from the demolition of a neighbours old stone pigsty, and built a beautiful frame for a dormer window, here called une lucarne or un chien-assis (lit: sitting dog). What makes a house “ecologically-friendly” and what might “green building” materials and methods be? Lots of things, is the short answer but if you care, I think one has to be honest and make fair comparisons. The Pavatex board, for example, is just wood fibres, compressed together : no nasty formaldehyde-containing glues and it acts as an insulating layer, a waterproof yet breathable layer beneath the slates and reduces sound transmission. This natural product is manufactured in Switzerland, so that’s a lot of transport miles / kilometres to add to its embodied energy. And, I guess, it takes a fair amount of energy to reduce solid wood to the fibres from which the boards are made. I’m on safer ground with the dormer wood frame, as the old oak beams would have gone on the fire or down the tip and only travelled here from next door and had a short journey to and from Jim’s workshop. Jim’s skills and machinery, have turned this characterful wood—which has already had one life as lintels in a stone pig sty—into a thing of art and beauty: carpentry to the standard of cabinet making. We discovered that Gabrielle has a natural talent for lead work. To explain: in buildings, there are many edges, where one surface in one material, meets another surface of, perhaps, a different construction. 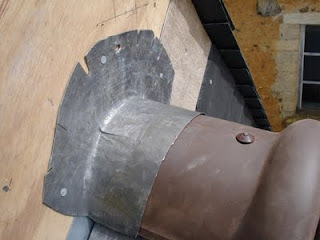 The detailing of such a joint is important for keeping water out and heat in. Our long barn actually consists of two barns joined together, with a slight change in ridge height where they meet: and so the need for some lead flashing. I am constantly afflicted by having extremely high standards that are awkwardly matched to a lack of competence or even complete lack of knowing what I’m meant to be doing. Oh, and an uncomfortable lack of patience! I knew the I had to fit a piece of lead around the last ridge tile and onto the wall of the higher barn. This involves forming a flat piece of metal into a three-dimensional affair that has to snugly fit the semicircle of the tile then fold flat at right angles. The only way to achieve this is by stretching the metal. I fabricated a wooden tool to do this and roughly knew what I was meant to be doing. Why do I (repeatedly) think that I can achieve a perfect job at the first attempt, without having been shown how to do it or completed a course, let alone a full apprenticeship? It took about 30 seconds before my patience gave out at my inability to hammer the flat lead into the perfect form and I went in search of Gabrielle for moral support. She offered more than a “there, there” and set about with the wooden tool, tap-tapping the lead, gently persuading it to wilt to her will and assume the impossible shape. See for yourself and remember that this started out as a flat piece of thick lead … and at her first attempt. Many people have contributed to elevating this building work into the realms of fine art! With memories of help from David for helping me strip the roof, Samuel for helping me replace all the rafters and repair the tops of the walls,Gabrielle for her lead work, Jim for his carpentry/joinery skills and teaching me how to slate, Jacques’ for the special stuff with slate and zinc around the dormer and you can see why (photo at top) I’m so happy to drizzle a drop of bubbly on the completed roof : the topping off ceremony. Tis David here, thanks for the mention in helping to strip the roof. You're more than welcome! I was looking at the photos and having a read and was well impressed and enjoying seeing how far it has come on. I'm nicely settled back to life in Ireland now. Living in a big house in the south west of Cork with three friends and busying myself with garden projects and music amongst other things. Regards gardening I've been exploring how to do work with 'the soil food web', very interesting and I'd draw Gabrielles attention to the book 'Teaming with Microbes' if it sounds appealing. Oh and our house will be getting chickens in the near future, my first small steps in animal husbandry so looking forward to that. Keep up the great work and informative blog. I reckon when I do get my own plot I'll be going over past posts for inspiration and guidance.